Mike Townsend in October at the Burlington Free Press' gubernatorial debate. Updated Monday, November 10, at 1:05 p.m.: As noted below, Seven Days reached out to Townsend and Silverman on Friday for comment on why they never respond to Seven Days’ requests for comment. Silverman replied Monday morning with the following: “Because I don’t have time for agenda-driven peddlers of inaccurate snark.” We thank him for getting back to us. 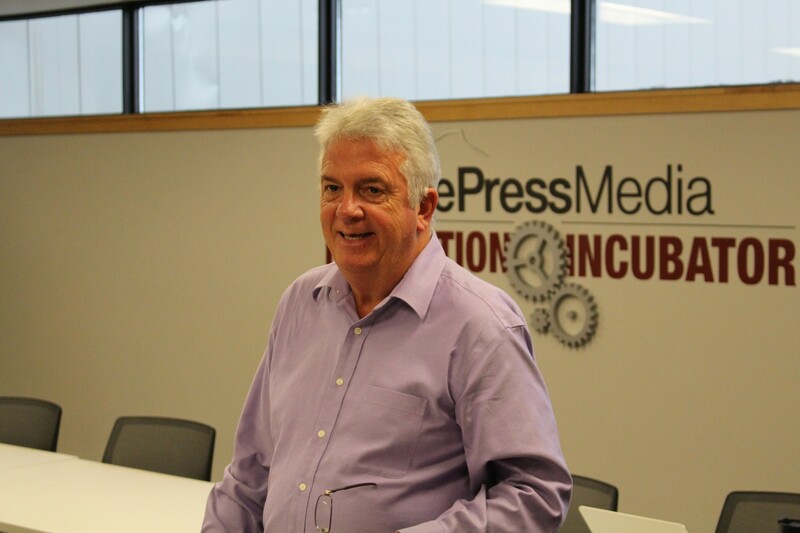 Burlington Free Press executive editor Mike Townsend defended the paper's ongoing restructuring Friday afternoon in a story posted to the paper's website. Townsend began by lashing out at what he called "rumors and speculation" about whether the paper would continue to cover Vermont government and politics. On Tuesday, veteran Statehouse reporters Terri Hallenbeck and Nancy Remsen said they would leave the Free Press after a collective 35 years at the paper. Both had been offered new jobs covering community news, but declined. The first thing I need to do is correct misinformation swirling around on social media as we go through a significant staff reorganization. The rumors and speculation that we are abandoning coverage in Montpelier are dead wrong. Of course we will continue to cover the Statehouse. Period. Now that the air has been cleared of that bit of nonsense, let's move on. Townsend's note was curious, because he has refused to respond to repeated questions from Seven Days and other news outlets since the Free Press began eliminating positions two months ago through voluntary departures, retirements and layoffs. In August, since-departed publisher Jim Fogler told my colleague, Alicia Freese, he had "no concerns" about Gannett's decision to spin off its profitable television and digital properties from its less profitable newspapers. "Yes, very exciting transformational news from the Gannett Company yesterday," he wrote in an email to Freese. In October, Townsend wrote a story disclosing that Free Press reporters would have to apply for new jobs at the paper. He provided no further details. At a gubernatorial debate the next day, Townsend told Seven Days, "I don't talk to you guys. I'm old-fashioned when it comes to competition." Each time, of course, we called or emailed management. Often we did both. First, we tried Fogler. After his departure, we reached out to Townsend and associate editor Adam Silverman. Each time, they declined to talk. Strange behavior from a paper that prides itself on demanding "transparency" from others. And just the kind of silence that breeds "misinformation," "rumors" and "speculation." Hope you're doing well. Like many journalists, I've been following the news that Gannett plans to restructure all the newsrooms at its community papers. I'm wondering whether you'd be willing to talk about the Burlington Free Press' plans in a phone interview. My cell is 598-8946. If not, would you be willing to answer the following questions via email? -Do you expect the Free Press will restructure its newsroom in any way in the coming months? What have you been told by Gannett HQ? -Will the Free Press ask its employees to re-apply for their jobs as part of a restructuring, as other Gannett properties have recently done? If so, will there be a reduction in the number of positions available? By how many? -Several reports have indicated that the "Newsroom of the Future" will include new job descriptions for all employees. Can you provide the descriptions the Free Press will use, if it uses them? -Can you describe any other changes to content, news-gathering approach and employment planned for the next few months? Just wanted to make sure you got my messages (copied below). Would appreciate talking with you — or hearing back from you via email — by the end of the day today. My cell is 598-8946. Still interested in speaking with you about this. Mind responding to my email or giving me a ring? I'm hearing that you outlined some of the personnel changes being made at a staff meeting last week. Mind giving me a ring to talk about it? I'm planning to write about it in this week's column. Congratulations on the new gig, Jim. Mind giving me a ring to talk about it? My cell is 598-8946. Thanks! I'm sorry to see that Sam is retiring. I'm hoping to write about this in my column and on our blog and would appreciate a comment from either of you about his work and legacy. If you'd rather talk over the phone, my cell is 598-8946. -How many staffers must reapply for their jobs? Mike's tweet seemed to indicate that two editors and an experienced reporter were exempt from the move. Am I reading that right? If so, who are those three staffers? -Will there be fewer new jobs than old jobs? Can you provide numbers on both sides of the equation? -Will the new jobs be publicly posted? If so, can you provide descriptions? -Do you expect any staffers to lose pay or benefits in the transition? If so, can you elaborate? -Are the cuts restricted to the newsroom or will they hit all of the Free Press' operations? -When must staffers reapply and when will the new hires be announced? -Are you technically laying off all Burlington employees and asking them to re-apply? -Is the goal to cut the newsroom budget by 15 percent, as has been reported of other Gannett papers? -Were Sam Hemingway's and Jim Fogler's departures related to this restructuring? Thanks in advance for getting back to me. I appreciate it. Left a message for you in your voicemail. I'm writing about Lynn Monty's decision not to re-apply for her job and her departure from the Freeps last week. I'd appreciate the opportunity to speak with you about what happened. I'd also be happy to take a written statement. Care to comment on his departure or the new beats? I'm planning to include a shorter version of this story in this week's column. Any further comment on what I've already written — or the latest departures? I'm wondering why you never respond to Seven Days' requests for comment. Care to comment on your repeated refusal to comment? I'm writing a story about it. And would appreciate a response.